The game still seems to be highly regarded, as it has a score of 7.8 from 66 votes at LemonAmiga, a 7.2 from 48 votes at Atarimania, and a very respectable 4.58 out of 5 from 12 votes for the DOS version at MyAbandonware, but as usual, there seems to be no reviews or ratings for the A2GS version, although I often have seen it being said to be the best one of the lot - not very surprising, considering that it is the original. The Sega conversion seems to be widely considered as the worst of the lot, and the Sega-16 website has rated it with a meagre 4 out of 10. Well, read on and see how the first comparison of season three pans out. This game could be quickly described with a few words as a puzzle-oriented fantasy mini-golf game in isometric 3D. And you can't really describe it any differently with less effort, but I should probably mention that it also features a weird sense of humour, plenty of nice graphics and funny sounds, as well as an obligatory two-player mode. There are only 9 holes in the course, although with luck, you might be able to play a special bonus stage. The relatively little that Zany Golf has to offer, it does it in a unique manner, and getting through the game requires plenty of time and perseverance, because some of the puzzles later in the game can be more than a little confusing. It's not your regular golf game, so completing the game feels a bit more extraordinary than swinging your way through a normal 18-holer. Zany Golf is one of the rare mini-golf games that I can heartily recommend to every gamer out there, but the question really is, which versions are the most recommendable ones. Because the loading times are practically impossible to compare in this case, let's skip straight to the Playability section. Mind you, the Sega version is clearly the quickest one of the lot concerning loading, being a cartridge release, so I guess that item was settled right there. Like pretty much all digital mini-golf games before and after Zany Golf, the basic idea is to aim and measure the power of your shot, with the goal being to get the golf ball into the designated hole with as low number of shots as possible. This golf being zany, the amount of unrealistic and often a bit ridiculous items on the playing fields can become rather high. Contrary to regular golf rules, you have a limited number of shots you can use before the game is over, but bonus shots can be awarded by completing certain missions explained in either the Pause screen or in the tip screens shown before levels - these would include either collecting sprites from somewhere in the levels, finishing the hole within a time limit, or performing other level-related tricks. Once the game has loaded up, the unpassable but thankfully short credits sequence kicks in, after which the scrolling title screen shows up. This is where you either select the number of players, or if you're playing the SEGA version, press the Start button. Pressing the Start button in the Sega version will get you to an options menu, where you can select the number of players, toggle both music and sound effects, as well as one of four skill levels: Practice, Beginner, Intermediate and Advanced. I haven't seen a possibility to choose a skill level in any other version, so I suppose it is an exclusive feature in the SEGA version. You can toggle the music and sound effects off in all the other versions during play by pressing F5 or some other designated key. Before I move on to the differences, I shall explain all the holes in the game. The idea is to get the ball through the windmill doorway, through which it has the possibility to go straight into the hole, and you can earn an extra shot by hitting the doorway. Otherwise, you can go down from the ramp below the windmill, and get to the second area, where the hole is. As you enter this level, you can see a hamburger on top of the hole. You must click on the hamburger repeatedly in order to make it bounce on spot, which then allows you to shoot the ball in the hole behind two corners. Watch out for ramps, though. You start this level from the other end of a corridor with three continuously rising and falling walls. Linked by a large ramp, the level features a few separated areas at a lower level, one of which contains the hole you must get into. Fairly easy to perform a hole-in-one in this one. As the name suggests, this is a pinball table. Your mission is to light up three numbers at the lower half of the table and then hit the connecting hole at the top of the table. If you succeed, you have a good chance at another hole-in-one, but this is a bit too luck-based for that. Clicking the mouse button in this level will flip the flippers and bring up the middle triangle-shaped item. Although this is a fairly long level, the focus this time is on using the fans positioned along the level. Moving the cursor left and right rapidly will make the fans blow, effectively moving the ball by windpower. With a bit of luck, it's another level possible to complete with one shot. A special surface covering most of the level allows direct mouse control over the ball. With a good framerate and a clean mouse, it should be relatively easy to do a hole-in-one here. Another level separated into two parts. This time, you have to get the ball uphill behind a corner through a castle gate, in order to get some nice animations, but I don't think I have ever managed to get a hole-in-one even by succeeding in the first objective. At least, this does award you an extra shot. The actual hole is at the bottom half of the map. Probably the most irritating hole in the entire game, since the actual hole is placed on top of a hill, and moves around the hilltop when the ball passes through the top half of the ramps to and from any direction. Around the ant hill, there are seven small areas with bumpers at the back, which allow you to bounce the ball back towards the hill, as well as the eighth area where you start the level from, which contains no bumpers. The final level of the actual set, and easily the most difficult of the lot, if not quite as irritating as the previous. Yet again, this is a level with two areas, but this time, careless aiming can cost you dearly. You start off from the bottom half of the level, where you must press two buttons on a large computer, while avoiding energy shields and laser beams. After this, you must shoot the ball into a suction tube, which leads to the top level. The top level consists of a good lot of false holes, which will lead your ball to get back to the lower level via the mouse hole at the far right end of the map. There is also an extra level, which you can access either by completing the course under par (26), or by putting into the mouse hole in ENERGY while red eyes are shown within. Level 10, which is called MYSTERY in all the other versions except for the SEGA version, where it has been re-titled as KNOCKOUT NIGHTMARE, features a Breakout-style scenario, as well as teleport-trap maze. Due to the lack of a mouse or similar pointing device, the SEGA version doesn't feature the MAGIC CARPET level, but instead, this bonus level appears right after ANT HILL, and has no actual bonus level as a result. Since the Sega version is now being examined more closely, I might as well add that all the level names have been slightly altered from the originals, and you get to see such alterations as "Hamburger Hill", "Pinball Palace" and "Chaotic Castle". Since we also got around to the controls already, let's continue on that theme. Zany Golf was clearly designed to be played primarily with a mouse, but since it's mostly about moving a cursor around and clicking on things, a keyboard, a joypad or a joystick will do as well, but will not likely be as comfortable as the intended method. All of the levels in the game, while not necessarily large by at least regular mini-golf standards, are shown in an isometric 3D-view from a relatively close zoom-in, so you will need to move the cursor around the edges of the screen in order to move the screen's position on the map. And here is where some more alarmingly notable differences show up. If you play the game with a mouse, you will only need to click the left mouse button on the ball, keep the button down and pull the cursor in the exact opposite direction of where you want the ball to go, and as far as you want it to go by making the length of the dotted line appropriate, and finally releasing the button. The same method is used for the joystick controls, although moving the cursor around the screen can feel a bit sluggish compared to a mouse. The DOS version uses the keyboard as your default controller, but you can choose to use the mouse by typing "zany.com m" as the launch command for the game. Using a keyboard is a bit more tricky: you need to select the ball by pressing the Space bar once on it, then aim as you wish with the cursor, and finally press the Space bar again to hit the ball. Unfortunately, using the cursor keys to move your cursor around can prove a bit tiresome, since the cursor will slide into the direction for a great length from one tap of a directional button, so you need to either be quick at making adjustments, or prepare yourself to make lots of counter-adjustments. None of this is as bad as the SEGA version, however, which uses an accelerating cursor. This can be incredibly annoying - when you start to move the cursor, it is very slow, and once it gains momentum, you can hardly control it, and the screen can move around nearly uncontrollably. The amount of time it uses a workable speed is very short, so you need to be careful if you want to be quick. Not a logical combination. Since Zany Golf is shown in isometric 3D and features plenty of graphics, and most particularly big animated elements, it will come as no big surprise that it can occasionally be rather heavy on the CPU. The most notable slowdowns usually happen in strategically important bits. Happily, the game can be completed with a bit of luck, so the slowdown will not be that much of a problem, but it can lessen the enjoyability of the game. The version that suffers the most from framerate drops is unfortunately the SEGA version, where the troublesome controllability is made even more troublesome by the occasional bad framerate. Not only do the AMIGA and ATARI ST versions also suffer from severe framerate issues in a few places, but the original does so as well... just not quite as often nor quite as badly as the SEGA version. In this case, both the A2GS and DOS versions win, because their scrolling is the smoothest, regardless of all the action on the screen, although I must point out that playing the A2GS Zany Golf on KEGS will not be as comfortable as playing the DOS version in DOSbox, because KEGS emulation hasn't been developed in years, and it feels as smooth as all the others. I saw a YouTube video, where someone was playing Zany Golf on a real A2GS, and it ran as smoothly and quickly as the DOS version at best, so I have to consider this a draw for those two. So, at least for those of us who use a Windows PC, I'd say the DOS version is the most comfortable one to play now, unless you actually have a real A2GS lying around somewhere. Fortunately, the game is still playable enough on KEGS as well, since you will be using a mouse instead of a joystick anyway. Not that it's completely unplayable on any platform, but there is quite a clear order of preference here. Since all the versions are based on the original APPLE game, and can more or less display everything required, there is little point in concentrating on the quality of artwork too much. The only version which is clearly inferior to the original in terms of colours is the DOS conversion, which was made to only use the EGA capabilities, meaning that only 16 colours out of possible 64 could be used simultaneously at any given time, compared to the full 256 colours per screen in the original, as well as most other conversions. The biggest differences are, as mentioned earlier, in the frame numbers of all the animations and how well the hardware can handle all the animations and other graphical elements. But let's take a look at the few differences in the graphics design department first. Before the actual title screens are shown, there are a few text bits, which are irrelevant for this section, so we shall start with the title screens. What is noteworthy about Zany Golf's title screen, is that it is a huge animated piece of madness, that has been stretched onto the length of about 4-5 actual screens, and scrolls from top to bottom. The animation bits are similar enough in all five versions: the ZANY GOLF text has randomly placed quickly flashing light bulbs, and the Electronic Arts logo block spins around in place, flashing the EOA letters in the right places, and the spinning block casting an accordingly moving shadow in the above ZANY GOLF block. The differences are in the size of the title thing - more particularly how it fits on the screen - and the colouring of it. Clearly, the DOS version with its EGA colouring stands out from the rest, but it's not as bad as it could have been. If you're looking for something zany, I'd say the EGA colouring brings out the zaniness of the game more than the proper colouring, but I guess it's a matter of taste, which one of the lot you prefer. Of course, the APPLE look is the original, and how it is really supposed to look like, so we shall keep that one as the point of comparison. That said, although the A2GS version has the right colours, the whole picture hasn't fit onto the screen properly, leaving out a bit of the triangular thing behind the ZANY GOLF block, whereas every other version has this fully shown. Strangely, the DOS version stops scrolling before having shown every last bit of the bottom area, so the picture is incomplete there as well. Next stop, the level loading pictures. As previously, there are no serious amount of differences in any of the versions you would expect to have any, and the DOS version has it mostly in colours, although the "Fans" level makes an exception in the form by having no strange pink transparent blob-looking plate thing between the "Fans" text and the actual fan in the background, because the number of colours available wouldn't allow for such an element. However, there is one surprisingly tragic difference in the SEGA version, which you actually might have guessed already, if you weren't aware from earlier experience - there are no level loading pictures, because you don't need to spend much time loading from a cartridge. This might explain for some part, why the level titles have been altered as they are. Obviously, I didn't include all the loading pictures from the game, because as before, I want you to experience as much of the game as possible without too much unnecessary graphical information here. Most of the really interesting bits will be left for you to find out, but I will show you a couple of screenshots from some few select levels in addition to the select few level loading pictures. Each level begins with an instructional screen, which includes a map of the whole area of the current hole, as well as descriptions of any special missions within the level. The most clearly visible differences are, in fact, within the text bits, although you can see some minor layout differences in the spacing of certain things, if you care to examine them more closely. Needless to say, the DOS version has differently coloured maps due to the EGA palette, but really, the most dramatically different screens are in the SEGA version, in which these act as level title screens as well as pause screens. All the other versions only show a blue Pause indicator at the top panel when the Pause mode is on, and the level titles are shown in the loading screens. Screenshots from the Windmill Hole. You can see from the first level already, that the graphics style is similar across all the platforms throughout the game, and the EGA palette remains the only one with any drastic effect to the colouring. The biggest difference, which might make some sort of a difference, is the size of the action screen, which differs surprisingly much. The ATARI ST version has the lowest height for the screen, while the A2GS has the narrowest one. The SEGA screen is overall the second smallest, and the DOS and AMIGA versions battle for the biggest screen - Amiga having the most height and the second most width, and DOS having the most width and as much height as the original and Sega screens. For the most part, having more height in the action screen is more advantageous for reacting to events, but in the end, the differences are little enough to matter. Screenshots from the Hamburger Hole. 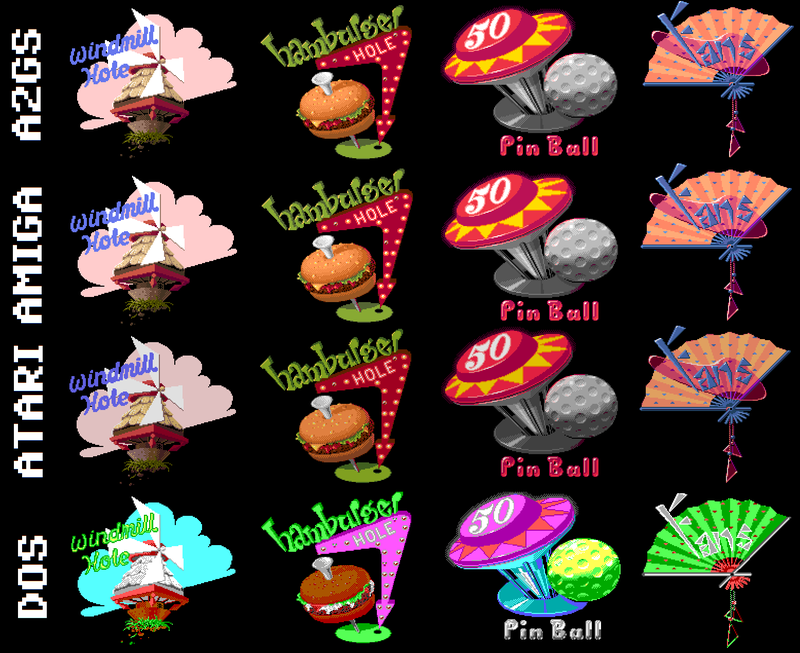 One of Zany Golf's most important aspects is the graphic design, which for the most part is thankfully fairly straight-forward and pleasingly clear, but there is just enough of weird ideas to bring this mini-golf game its very personal touch. Mostly, the focus is on the off-beat items, most of which have an important function in the levels, and stand out with their general silliness and their often goofy animations. What got me hooked on my first play was the insane bouncing hamburger with its clearly showing internals and the nearly-dripping sauce, which you need to make bounce yourself, before being able to putt the ball in the hole. The same level features a bottle of ketchup in another corner, which you have to bounce off from, and make the bottle squirt a little ketchup (or catsup, as it is spelled in the game) while at it. While this is all fun and great as an idea, this amount of animation and graphical elements can bring a computer on its knees due to heavy processing requirements. Only in the original and the DOS version (depending on the PC setup), it is possible to see the animations in their full speed, although unfortunately, the EGA palette makes a bit of a mess of the hamburger. So, once again, the graphics are directly related to the gameplay due to differences in processing power. And unfortunately, this example of bad colouring also gives a minus point for the DOS version. Screenshots from the Pin Ball level. Although every hole in the game was designed to fit the rather unorthodox formula, there are a couple of levels that stretch the game's genre limits elsewhere. The more commonly known of them, of course, is the "Pin Ball" level, which makes you play pinball with your golf ball before you are allowed to actually putt into the hole outside of the pinball table, in case the ball doesn't roll straight into the hole once you have gotten out of the table. In levels such as this, the isometric 3D aspect is very much justified to make things look more plausible considering all the physics involved, even though it can make finding the right angles in certain places more difficult than in a top-down aspect. The only other reason I included one final set of in-game screenshots is because the DOS version has a peculiar manner that isn't featured in any other version: it blacks out the entire information panel at the top of the screen when the ball is on the move. It doesn't matter all that much really, since you can see all the necessary information between shots, but it feels a bit incomplete as it is. I don't have anything more to say regarding the look of the graphics, so I shall not throw any more unnecessary level pictures for you to look at, because it's more pleasurable to actually experience the game for yourself. But I would like to point out, in case it hasn't become clear yet, that the versions that have worse scrolling, are less fun to play in the long run. Finally, we shall have to take a look at the scorecards, because the Game Over screens are nothing but simple text bits in a black box overlaid on top of the level graphics. Besides, the scorecard is what you will see after the game is over regardless of how well you performed. Surprisingly, there are some design differences among our five versions, as well as some colouring differences - in addition to the obvious level order in one certain occasion. And yes, the DOS version looks consistently different due to the EGA palette, but that's a given. 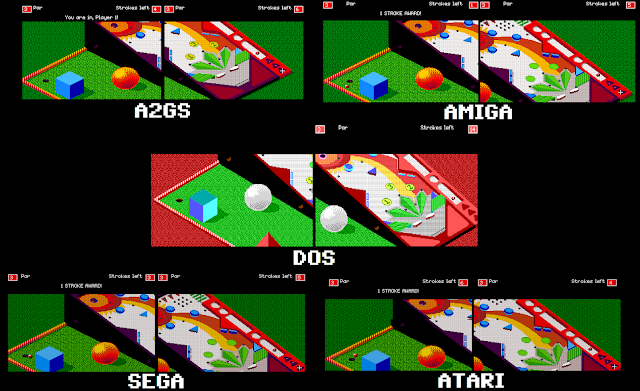 The SEGA version has been updated to feature no "Player#" at the top row, and instead features each player's corresponding ball colour, and the Par text has also been switched to read from top to bottom rather than aligned from bottom to top of their respective slots, which is what I think how it should look, if you were wanting the scorecard to look more akin to an official golf scorecard. But I could be wrong, of course. I just think it looks better the original way. The SEGA version does feature some graphical bits that cannot be found elsewhere, namely the animated EOA starter logo, the new initial title screen and the options screen. None of these screens bring anything particularly interesting to the graphics, but the options screen would have been nice to have in all the other versions as well, just because of its functions. However, this doesn't really help the omission of the "Magic Carpet" level, which is an important part of the game due to its unique control mechanics, as well as a whole level of graphics - nor does it help the omission of the level loader screens, which offer more important graphics concerning conceptual continuity. So, in the end, I can't really give the SEGA version any more credit than it deserves. The DOS version stands firmly above the slightly unfortunate SEGA version, even though the EGA palette doesn't always play to its advantage, for it offers smooth and fast scrolling, as well as all the levels and loader pictures. Still, it's not enough to beat all the rest of the lot, which offer a more proper palette. The A2GS original is clearly the winner this time, because it has it all - except for a more comfortable screen size, which isn't really all that necessary. Curiously, probably the most interesting section for this comparison concerns the sounds. Every version has its own particular style in the instrumentation of all the music, and although there are precious little sound effects in the game, they have their own personality as well. But since the majority of the game's sound output has to do with music, that is what I'm concentrating on for the most part now. In addition to the staggeringly over-the-top theme tune, the game offers a unique song for each level (yes, even the bonus one), all of which have their own thematic instrumentations. There are plenty of mock-operatic human-like voice samples to be heard, as well as horn sections, guitars, drums and even barrel organs and all other sorts of strange things in the game, and the musical styles range from circus waltz to horror polka, rock'n'roll and some sort of Tim Burton-esque fantasy jazz. Like all the great acts do it, however, it all blends well together in a nicely chaotic combination, but happily, most of the tunes are as memorable as any old earworm. In all honesty, I think it's one of the best soundtracks Electronic Arts have ever had in one of their games. As could be detected by listening to all the different versions, the original is definitely the most orchestrated one of the lot. According to Wikipedia, the musical score in the original A2GS version was designed to exploit the unique 15-voice Ensoniq music synthesizer in the GS, which offers a lot more possibilities than even the Paula soundchip on Amiga. Of course, the original music could likely have been completely sampled on the Amiga, but the quality would have suffered more than it did by arranging it properly for the available channels. As it is, though, the AMIGA soundtrack feels a bit bland compared to the original, as most of the music utilises similar instruments, whereas on the A2GS, all tunes have their own specific, slightly but clearly different sound. The only thing that keeps me from giving the highest praises to the A2GS soundtrack is that most of the music and effects are played from the left speaker - I only encountered a couple of times when something was played from the right. The Amiga version at least gives you a more balanced soundscape, and more importantly, it doesn't mix up the "level completed" ditty with the music still going on in the background. Naturally, the DOS version being still from a time when sound cards were not often utilised, it has only a PC speaker soundtrack, which can be annoying, but at least it has been put to the best possible use. The music sounds familiar, if not as interesting, and all the sound effects are in tact as well, and are played only when necessary. For some reason, the title tune has been left out of the game, but considering the rest of the output, it is no big loss. The ATARI ST version beats the beeping DOS version only by a fraction, because it doesn't use more than one sort of a sound for all the music - there are no discernable instruments other than a strange plastic beepy tone. At least it's multi-channeled, but has the odd quality of becoming more boring than the DOS version in time, because the ST version at least had the potential to be more interesting. Simply due to the sounds being actually multi-channeled and less attacking than the beeper noises, I shall give the ST a place above the DOS version. Before starting to go through all these versions of Zany Golf, I would have expected the SEGA version would have sound-wise been at least as bad as the ST version, if not worse, but happily, it's actually better. The music still feels tinny and plastic, as is usual for Sega games, but at least there are some clearly definable instruments in the mix, such as xylophones and kazoos and whatnot. The sound effects are also closer to what they should be, so I'd say the Sega version sits comfortably in the middle of the lot. From the little that I could say of the sound effects, I have noticed that apart from the A2GS and AMIGA versions, the quality of the sound effects correspond the music quality rather well. For the two mentioned, the AMIGA version has the upper hand at playing more effective sound effects, particularly in the later levels. So, I'm having a bit of doubts as to which one should I consider the better one here. I like having a balanced sound output, but then I also think more is more. I think I'm going to have to give the two versions a tied place, because I just can't decide. Now that this comparison has come to its end, it's time for some more of that ever-so irritating honesty. Sometimes, when people make requests of games that were only ever made for 16-bit machines, I am conflicted by the fact that graphics are often very similar in all 16-bits due to having less restrictions than the 8-bits, and thus would make less interesting comparisons, even though I know the games themselves offer plenty of interesting points to talk about. 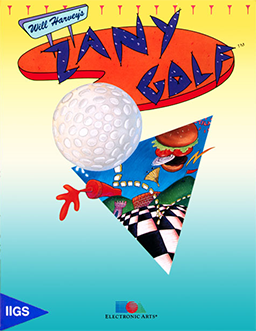 Zany Golf is only a proof of this exact sort of thing, although later on even the DOS versions would look more similar to their Amiga and Atari counterparts, and bringing in the Super Nintendo and other 16-bit machines would only make doing the comparison more exhausting because I can't really think of much to say about graphics that are similar enough in all versions. I chose Zany Golf as the example of this sort of thing because I was familiar enough with it not to have problems playing it through and getting all the aspects of it cleared up with little bother. Besides, it's a fun game to play for even longer periods of time, even if it is a coffee-break fun game at heart. Unfortunately, the blog format doesn't give games with only 16-bit (or better) versions much of a chance to display their differences as well as would be possible in, say, a video comparison, so unless I can find some video material from YouTube for similar comparisons, this will remain the only example of its kind. That's it for now. Next time, I shall be taking a look at one of the requests on my list, so I hope that proves more worth the bother. Thanks for reading, see you next time!